This condo has been sold but others come on the market. Contact me and I’ll tell you about what’s going on now in the market.You’ll love this cute Chapel Hill condo with 2 large bedrooms each with it’s own bath, half bath downstairs, and private garden all within walking distance to UNC. Washer and dryer included. 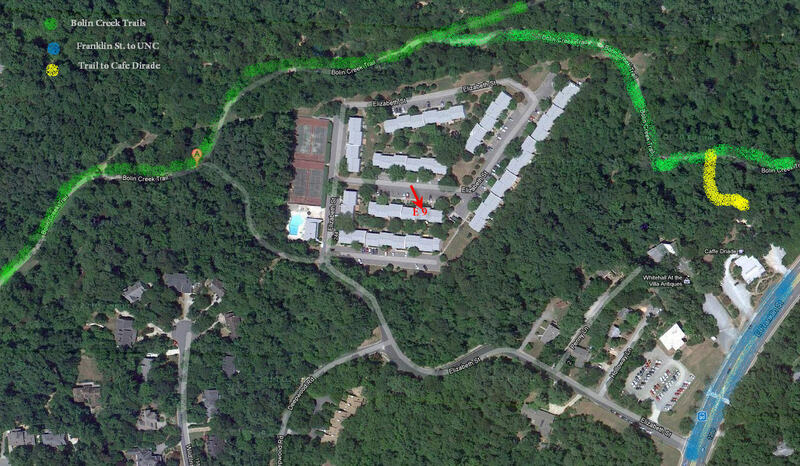 Located just off Franklin Street Village Green Condos are tucked away and private adjacent to the Bolin Creek Trails. Take the trail to the quaint and cool Cafe Dirade for coffee overlooking the woods and greenway. The neighborhood has a pool, basketball and tennis courts all in a private setting. Condo rejected for the following reasons: 1.The owner occupancy 50% not met. Submitter must document to show condo meets owner-occupancy. 2.Previous year’s actual year end result missing. Sumitter must provide Income & Expense Statement. 3.Reserve Study provided is outdated. Submitter to provide a more recent reserve study dated within the last 24 months. 4.Explanation needed on why recorded plat map & site plan not available. 5.FEMA Flood map showing location of project missing. Submitter to provide FEMA Flood Map. 6.Fidelty Bond coverage is not sufficent. Coverage must be the condo monthly assessment x 3 months & what is in reserve. There are only a handful of condos in Chapel Hill with FHA financing available. Check this site to find out the latest information. 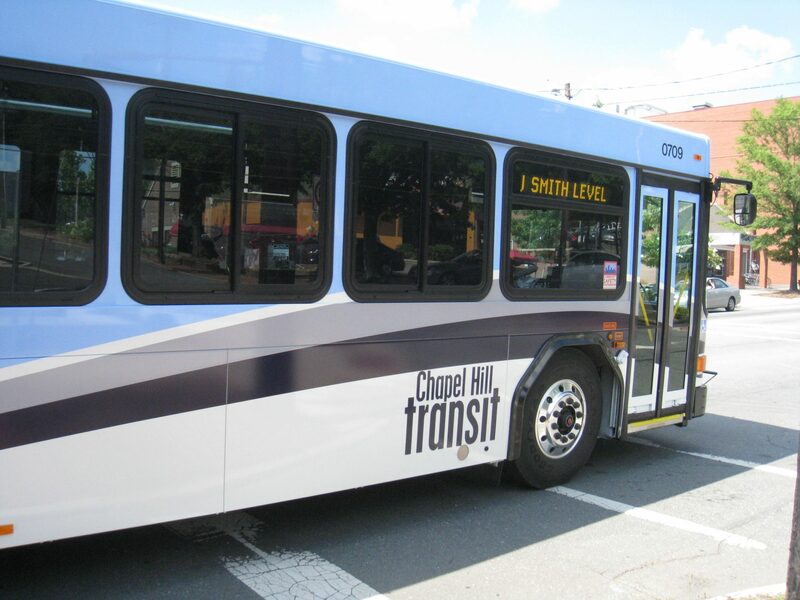 Busses in Chapel Hill are free so if you if you don’t feel like walking or biking to UNC you can take the bus. 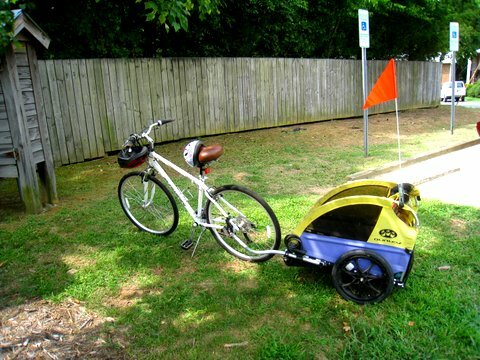 It’s all uphill to campus so you can always bring your bike on the bus and then ride downhill home to Village Green. There are lots of options when you live in such a convenient location. When the economy hit the downturn in around 2007 condos really suffered. Lenders were not interested in having condos in their portfolio and even though the market in Chapel Hill has always been strong, condos were in over supply in other areas of the country. Lenders restricted condo financing. For the past few years you could only buy a condo if you had cash. Values dropped. Now financing has eased up (as long as the condo will be owner occupied and not an investment property)and it’s a perfect time to buy with prices low and starting back up. Franklin Street is always changing. Businesses come and go. I love to see the small local business in town. So many cities are all the same with the same national shops and restaurants, you could be anywhere. Chapel Hill is different. The town has a real identity and Franklin Street is the heart of Chapel Hill. 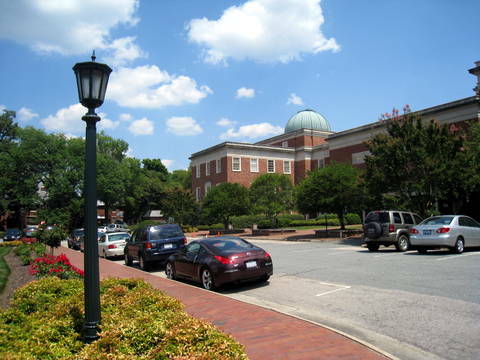 At the intersection of Franklin and Columbia Streets, the Campus of UNC joins with the Town of Chapel Hill . Take a drive with me down Franklin Street into Carrboro and I’ll show you around. Here is a transcript of the video if you would rather read about Chapel Hill and Franklin Street. and then we get into the area with some fraternity and sorority houses. that’s the post office and courthouse, more shops, Ye Olde Waffle Shoppe. of course, and then Spanky’s here on the corner of Franklin and Columbia. This is considered sort of the main intersection of Chapel Hill. Mediterranean food and you kind of go up and order at the counter. Brewery, that’s a very popular place. as we go by, see the pig? street. Coming up to the tracks. This is Marianne Howell Wright from Chapel Hill, North Carolina. 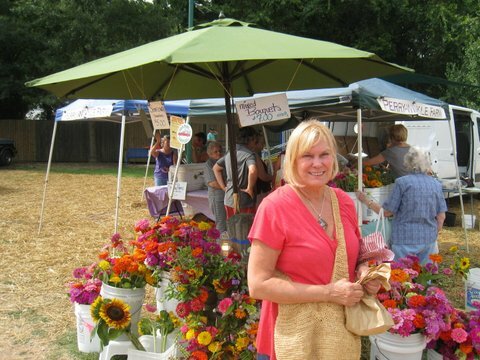 The Carrboro Farmers Market is open on Saturdays all year long and also on Wednesdays during the summer. Often I have had clients tell me that they went to the market and were disappointed, there wasn’t much of anything there. There is a good reason for that! North Carolina has a great climate but this isn’t southern California or Florida and the produce at the Carrboro Farmers Market is all local. In December there may only be some crafts, baked goods and bunches of collards and sweet potatoes. The last frost date when farmers can safely plant is mid April. Not too long after that the market starts to fill with wonderful color starting with light greens and peaking with reds,yellows,purples and oranges by mid August. 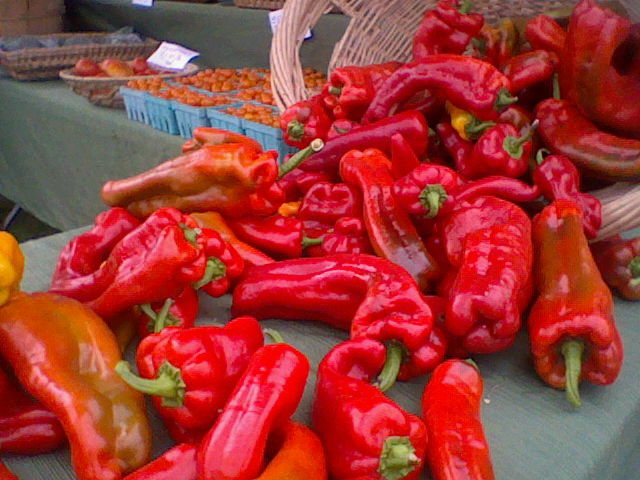 Many of the vendors have been selling their locally grown veggies for years and Saturday is a catch up day for them too. Carrboro and Chapel Hill are fairly small towns so it’s common to run into friends at every turn. The baby in the back pack or wagon will be running around munching on a cucumber before you know it. I always think I’ve bought too much at the farmers market when I’m making several trips to my car with baskets of beautiful veggies and flowers but it’s never the case. 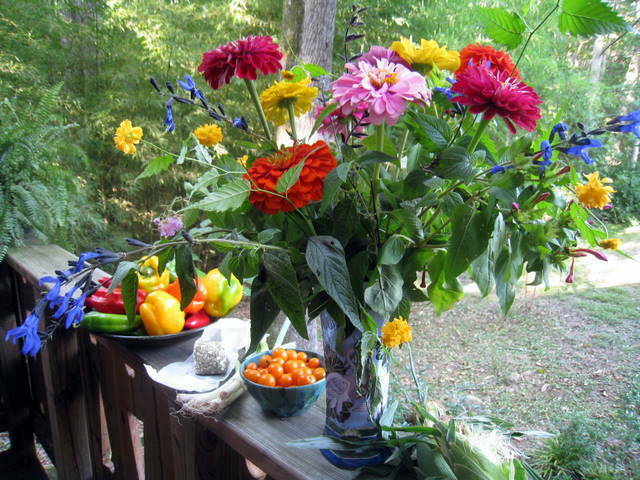 I always buy tomatoes, peppers, goat cheese, sourdough bread, basil, corn if it’s in and flowers. My husband likes the sausage and butter beans. The big fat blackberries are also a favorite. So now with a car full of delious things to eat, what’s for dinner? A favorite farmers market dinner is to chop up different colors of heirloom tomatoes and mix with olive, oil, garlic, pepper flakes and goat cheese. Cook some whole wheat pasta and toss. Sometimes we can’t wait and just dip fresh sourdough bread in the mixture. It’s so good! Don’t miss the Carrboro Farmers Market no matter what time of year!